But there is a simpler version that is pretty easy to make at home and, while rather different, is also very good. Angelina used to make this pizza casareccia, which she called ‘a pizz in her dialect, for us kids all the time. It was thick–more like a foccaccia perhaps than what you might usually think of as pizza. Angelina’s pizza makes for a wonderful snack or even an informal primo or antipasto. No special skills required. To make the pizza dough, begin by mixing the yeast well into the warm water with sugar and letting it proof for 5 minutes or so. Then put the flour in the bowl of a standing mixer, turn the mixer on to a moderately slow speed with the dough paddle attached. Add the yeast mixture and then a splash of olive oil. When those have been incorporated, start adding tepid water until a dough is formed; the exact quantity is not really possible to say, because there are so many variables, including the weather! The dough you want will be quite elastic but quite soft, even somewhat ‘wet’—much more so than, say, pasta dough—but it needs to be firm enough so you can work with it manageably. Now switch to the dough hook and knead the dough for a good 5 minutes or so. If you find that the dough is so wet it is not forming the proverbial ‘ball’, add more flour, bit by bit. After kneading, remove the dough from the bowl, plop it onto a lightly floured spianatoia or other surface, and knead it some more by hand, to make sure it has the right, springy consistency. Here’s the test: if you stick your finger into it, the dough should spring back, leaving no trace of your finger. Take your dough ball and let it rest in a deep bowl, covered with a cloth towel, for about 2 hours. (Lightly flouring or greasing the dough helps it to rise and prevents it from sticking to the sides of the bowl.) The dough should have risen quite a bit, doubling or even trebling in volume. The dough is now ready to use, although you can punch it down and let it rise a number of times if you like. The longer you let it rise, the tastier it will be. One of our favorite pizzerie in Rome, Dar Poeta in Trastevere, was famous for letting their doughs rise for 24 hours. To assemble and bake the pizza: Oil a baking dish generously with olive oil. Place the dough in the dish and spread it out with your fingers so it covers the entire bottom of the pan. Cover again with a towel and allow the dough to rise once more for about an hour. Now top the dough with crushed tomatoes that you will have drained in a sieve to remove the excess liquid or whole canned tomatoes that you will have passed through a food mill. Spread the tomatoes across the top gently with a spoon or spatula, leaving a rather thin coating. You can add whatever extra toppings that you like: anchovies (as pictured), capers, olives, etc. Finally, sprinkle the surface of the pizza with just a bit of oregano if you like (please, not too much, just a pinch) and drizzle generously with olive oil. Bake in a hot (200C/400F) oven for about 30-45 minutes. The dough should puff up but don’t allow the top to brown too much. To make sure it is cooked through, slip a small knife into it to see if it comes out clean and the dough feels ‘dry’. If in doubt, you can try a piece—the texture should be a bit chewy but not at all ‘doughy’—and put it back in the oven for a few more minutes. Allow the pizza to cool before eating; slightly warm or at room temperature, it’s delicious! The classic flour for making pizza in Italy is the finely milled ‘OO’ variety, but if you can’t find it easily, all purpose flour will do just fine. For a chewier (and very delicious) pizza, you can also use high-gluten flour. As mentioned, the choice of toppings is yours. 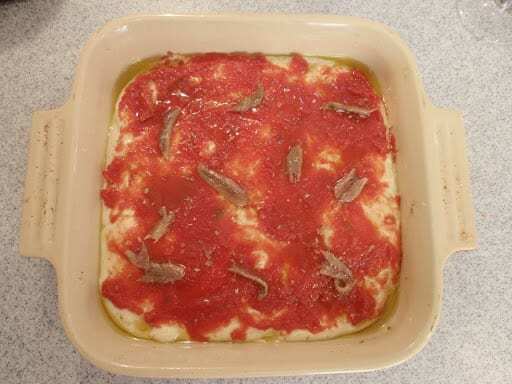 Angelina typically used either just tomato or (my personal favorite) tomato and anchovies. My Mom tells me that Angelina also sometimes topped her pizza with fried bread crumbs–something I don’t remember but I will have to try. If you want to top your pizza casareccia with mozzarella, add it only toward the end of cooking, and remove the pizza when the cheese is well melted. You can use pizza dough for other purposes, too. Angelina used to make little savory zeppole–balls of pizza dough, stuffed with anchovies and fried in olive oil. Hmm, those were really good. And, of course, zeppole can be sweet, too, dusted with confectioner’s sugar and, if you like, stuffed with jelly and other sweet things. In Rome, these are called Bigne di San Giuseppe, and are served on St. Joseph’s Day (19 March). And if you like, you can make this pizza very successfully with the same no-knead dough I recommend for making pane casereccio (homemade bread), adding a few spoonfuls of olive oil and a bit less water. Then put the flour in the bowl of a standing mixer, turn the mixer on to a moderately slow speed with the dough paddle attached. Add the yeast mixture and then a splash of olive oil. When those have been incorporated, start adding tepid water until a dough is formed; the exact quantity is not really possible to say, because there are so many variables, including the weather! The dough you want will be quite elastic but quite soft, even somewhat 'wet'—much more so than, say, pasta dough—but it needs to be firm enough so you can work with it manageably. Now switch to the dough hook and knead the dough for a good 5 minutes or so. If you find that the dough is so wet it is not forming the proverbial 'ball', add more flour, bit by bit. After kneading, remove the dough from the bowl, plop it onto a lightly floured spianatoia or other surface, and knead it some more by hand, to make sure it has the right, springy consistency. Here's the test: if you stick your finger into it, the dough should spring back, leaving no trace of your finger. Bake in a hot (200C/400F) oven for about 30-45 minutes. The dough should puff up but don't allow the top to brown too much. To make sure it is cooked through, slip a small knife into it to see if it comes out clean and the dough feels 'dry'. If in doubt, you can try a piece—the texture should be a bit chewy but not at all 'doughy'—and put it back in the oven for a few more minutes. Allow the pizza to cool before eating; slightly warm or at room temperature, it's delicious! Great post, Frank. I am currently in the same business as yours so I know pizza making is hard work. Only, I suspect adding salt to the flour may be better than adding it to the starter, though it is not completely clear if you actually do so. I really like this concept! I think it would be perfect for the kids and adults. Cant wait to try it! Thanks! It was a real treat for us when we were kids!